Impetigo (also called school sores) is a common skin infection. Two types of bacteria (germ) can cause impetigo, Streptococcus pyogenes and Staphylococcus aureus. Impetigo mostly affects children, but it can affect people of any age. Impetigo is passed on by skin-to-skin contact such as touching, so it spreads very easily. The symptoms of Impetigo are red sores or blisters, which burst to leave crusty, golden-brown patches. The sores can be itchy. The sores mostly affect the face and hands, but they can appear on other parts of the body. Impetigo usually needs treating to prevent complications and to stop the infection spreading. Gently clean the sores and try to cover the affected areas with dressings. You should see your GP if you think you or your child has impetigo. Mild impetigo is treated with antiseptic creams, such as hydrogen peroxide. It may also be treated with antibiotic creams, such as fusidic acid or mupirocin. If the impetigo is more severe or widespread, your doctor may recommend treating it with oral antibiotics. When and where should I seek help? If the infection isn't improving, or comes back, you should go back to your GP. How can I avoid spreading impetigo? If you or your child has impetigo, you should avoid close contact with other people. You shouldn't share towels and flannels until the infection has gone. Children and adults should stay away from school or work until 24 hours after starting treatment, or as advised by your GP. 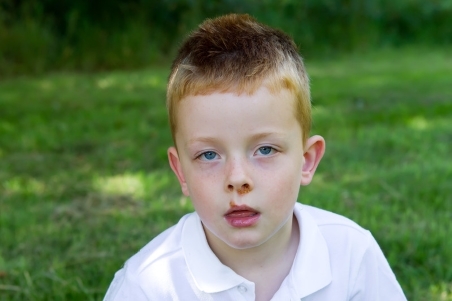 Information about impetigo in children, including photographs, and links to more information. A 24-page PDF explaining how to keep children's skin healthy, and how to treat common childhood skin infections. Written by HealthInfo clinical advisers. Last reviewed June 2018. Last updated March 2019. DermNet NZ – Impetigo. Retrieved November 2017.